Eastern (Pannonian) Celtic silver tetradrachm imitating Philip II. Eastern (Pannonian) Celts, ca. 3rd century BC. 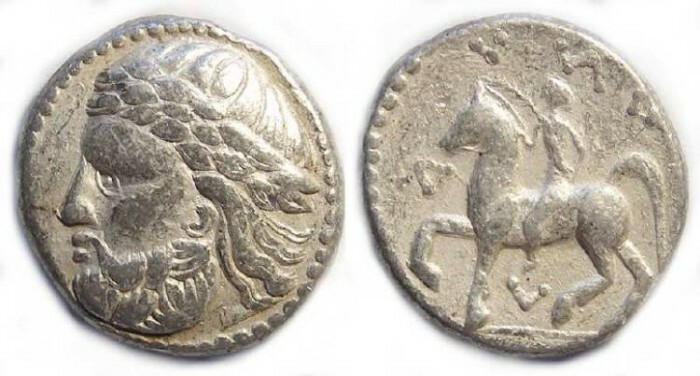 Denomination : Silver tetradrachm imitating type of Philip II of Macedonian. Size : 22.5 x 24.5 mm Weight : 14.12 grams. Reference : Sear-203 variety (there are hundreds of variations on this type). Obverse : Head of Zeus left. Reverse : Youth riding a horse left, with a circle below the horses belly, and a few crude Greek letters above the horse which a derived from Philip's name but now difficult to read.